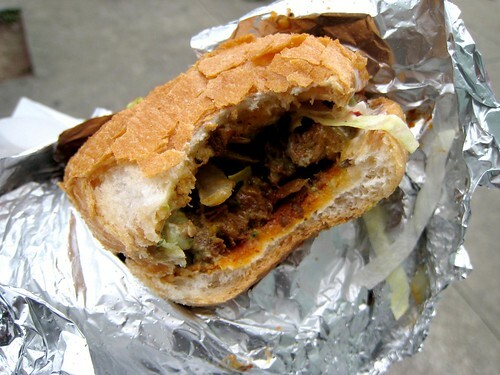 As if to make up for only eating at two places the day before, GQ, BH, and I started my fourth day in San Francisco by hitting up the Carnaval street fair in the Mission District, where there promised to be eats aplenty. But we might have come at the wrong time, because when we showed up there was little in the way of music, parade, or costumes. Instead, we found ourselves strolling through a typical lineup of vendors, the likes of which could have been found at any street fair in the nation. 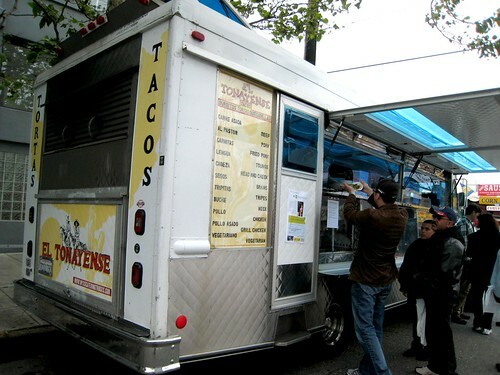 I'm not sure what made us stop to get food at the El Tonyayense truck, either, but stop we did, and I decided to get an al pastor torta. I should have skipped it for something else—the bread was tough and tasted either microwaved or steamed, and the pork was much too salty and also full of gristly bits. Meh. GQ did better with her purchase of a "maize'wich" from the Pica Pica Maize Kitchen stand, which as far as I can tell is also an actual restaurant in Napa. 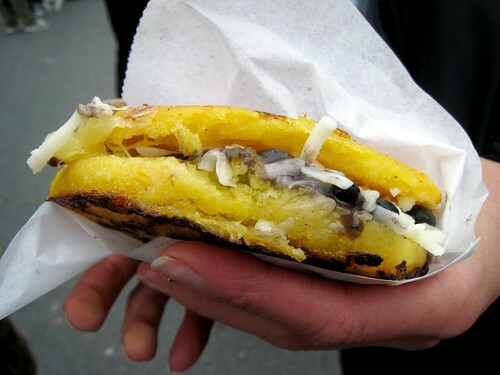 A thick corn pancake was split in half and filled with black beans, cheese, and marinated tomatoes, and the sweetness of the griddled pancake really worked with the salty filling. From the street fair we wandered over to Bi-Rite Creamery, where I skipped the famed salted caramel flavor (not salty enough for my tastes) in favor of a scoop of roasted banana. This particular ice cream was delicious, tasting exactly like the fruit but even more so, if that makes any sense. It was a long walk back from the Mission District to SoMa, and by the time we got back to GQ and BH's apartment we sat around to rest until our stomachs called out for a meal. After all the eating we had been doing, no one was in the mood for an intense meal, so of course for dinner we went to the Vietnamese restaurant Pagolac for "Seven Courses of Beef." Yes, had we each opted for the seven courses, it would have been another insane meal, but we wisely decided to order two portions to split among the three of us. We do have limits, you know. 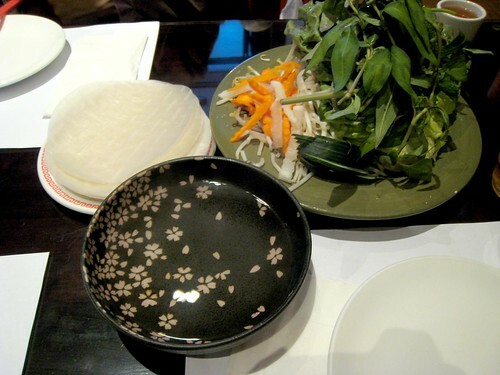 What you see above are the necessary elements for this kind of meal: a bowl of hot water; dried rice-flour sheets; nuoc mam; and a plate of lettuce, pickled carrots and daikon, and assorted fresh herbs. 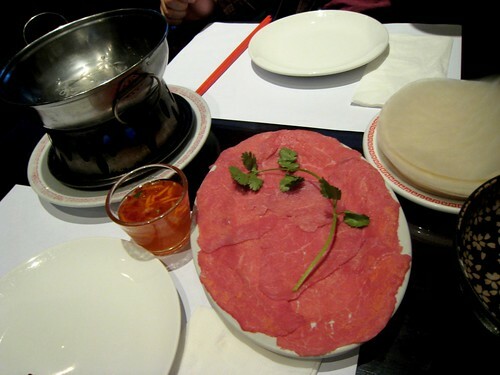 As each new course of beef comes out, you take the rice-flour sheet, dip it into the hot water until it softens, and then use it to wrap rolls filled with the veggies and beef. Once you have a respectable roll (or at least one that won't fall apart), you're ready to go. Dip one end into nuoc mam before taking a bite. 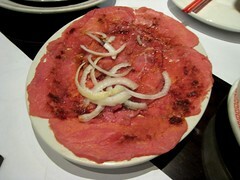 The first of the seven courses was a plate of marinated, nearly raw beef, which was delicious. 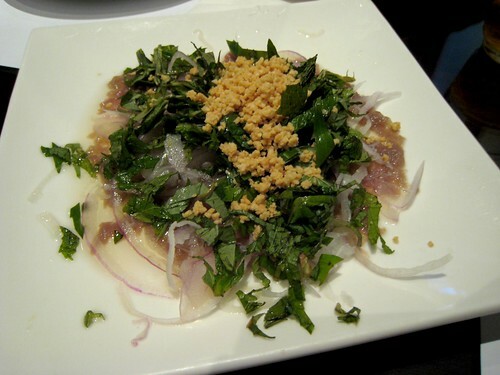 The dressing was tangy and sweet and the thinly shaved onions, herbs, and ground peanuts each added new dimensions to the dish. 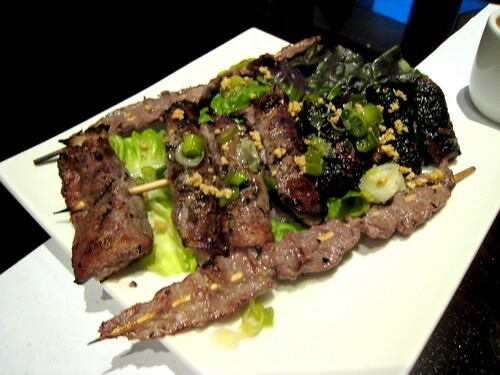 This beef preparation was one of two not meant to be wrapped in the rice-flour sheets. The next course was a plate of plain raw beef, meant to be cooked shabu-shabu style in broth. 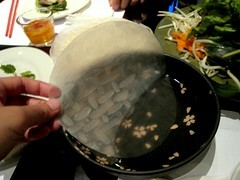 When each piece was done, we wrapped them with lettuce and herbs in the rice flour sheets. 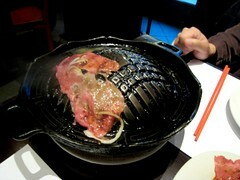 Same with the next course, which was beef painted with some kind of sauce, which we grilled at the table. The fourth, fifth, and sixth courses came out together on one plate. They were all grilled versions of beef: a crumbly sausage, a skewer of rolled beef, and a skewer of beef that had been barbecued flat. They all sort of had the same flavor profile, but they were all good. We just kept on wrapping and eating away; our rice paper sheets and veg were refilled as requested. The last course was a supremely comforting soup of toasted rice, beef, and scallions in a light, flavorful broth. It was the perfect end to the meal, and they were nice enough to give us three bowls for the three of us even though we had only ordered two portions. 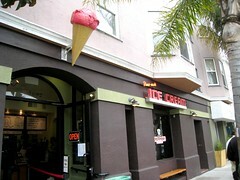 The next morning I would be flying out of San Francisco, and I was happy to have had such a unique eating experience as my last real meal in the city. I'd have one more meal coming though, sort of…. That all looks awesome! 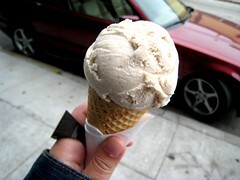 I mixed a scoop of roasted banana with a scoop of salted caramel at Bi-rite for the ultimate. Not salty enough for me either but combined was just tasty enough it didn't matter. PS I literally just attempted to wrap summer rolls last night so the pic had me giggling. Mine look SO bad. Sigh. Combining salted caramel and roasted banana—brilliant! 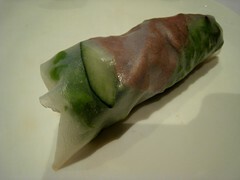 And the pictured summer roll was the best one I could come up with. You'd probably laugh at any of the other ones I made.